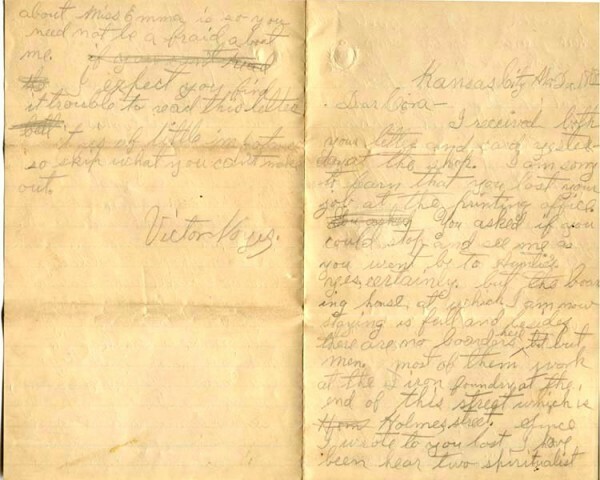 The date on the letter looks like Dec 1887 but Victor died in 1886. The date has been determined to be 1883, it being known that Victor was working in a tin shop in Kansas City in March of 1884. 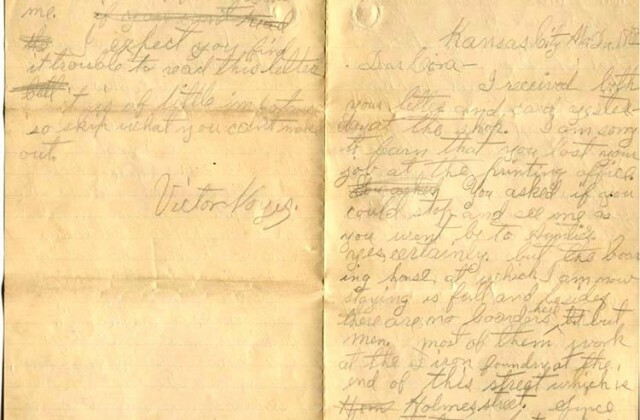 Victor, son of James Allen Noyes and Caroline Atwell, of Liberal, Missouri was writing his sister Cora, who had been apparently inquiring about visiting. She had recently lost a job at a printing shop, possibly in Liberal. He writes of activity at the tin shop where he works in Kansas City, the boarding house on Holmes street, a walk along the river, and a fledgling romance. He also writes of having been to two spiritualist lectures. 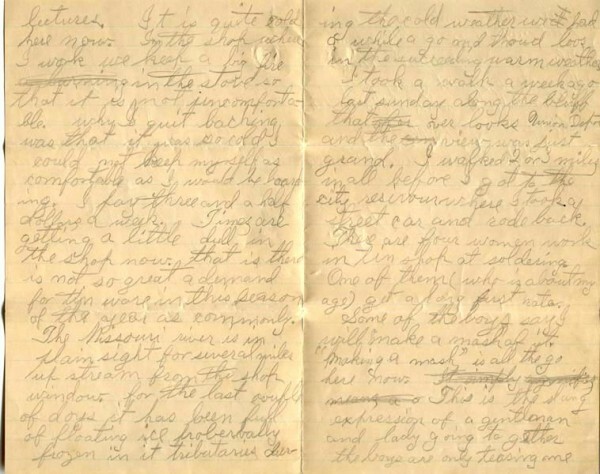 Transcription of the letter follows the images. I received both your letters and card yesterday at the shop. I am sorry to learn that you lost your job at the printing office. the cold weather we had a while ago and thawd loos in the succeeding warm weather. I took a walk a week ago last sunday along the bluff that overlooks Union Depot and the view was just grand. I walked 2 or 3 miles in all before I got to the city reservoir (?) where I took a street car and rode back. There are four women work in tin shop at soldering. One of them (who is about my age) get a long first rate. about Miss Emma is so you need not be afraid about me. I expect you find it trouble to read this letter. It is of little importance so skip what you can’t make out. Thought I’d add a link to a page where you can view what the old Union Depot in Kansas City looked like circa 1880.